If I had to write a top 10 list of things that make me happy, baths and chai lattes would be up there. Not so long ago I discovered that you can combine the two! That's right! 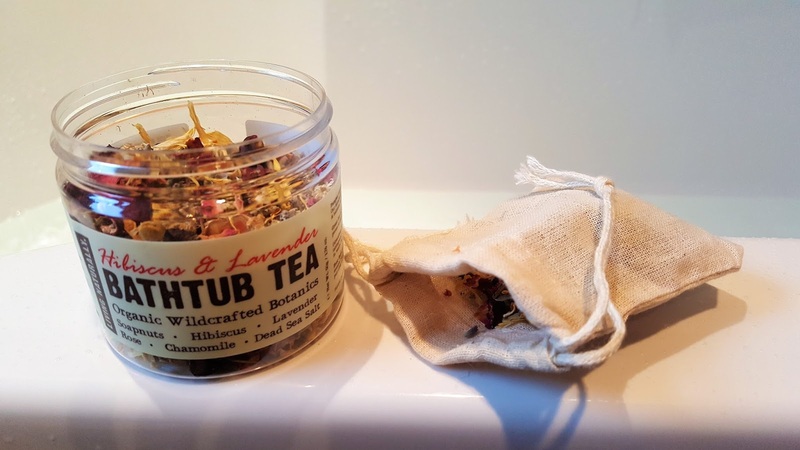 Living Naturally have created a range of teas for your bath and I've been trying them out. Naturally I tried the chai one first. Opening the tub I was welcomed with the familiar chai latte fragrance I know and love. The packet suggests using 2 tablespoons in the bath. I did this but found the scent too weak so I added at least double. 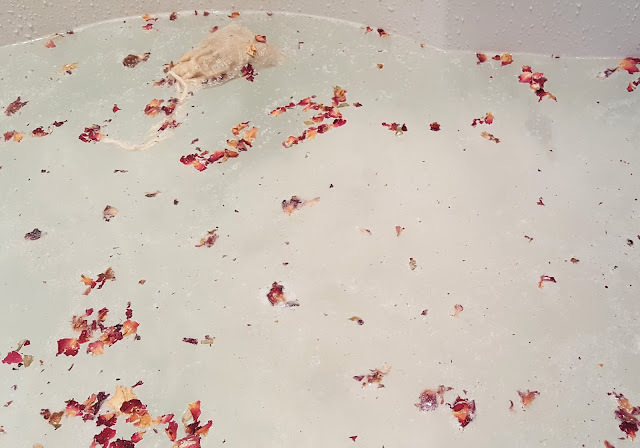 I was expecting to feel like I was bathing in a bathtub full of hot chai but in reality the scent is much more subtle so great if you don't want to be overwhelmed with tea. The Hibiscus & Lavender and Calendula & Comfrey bathtub teas are not powdery like the other two and instead are more like the loose leaf teas we drink. As such, they both came with a reusable "teabag" for the bath. Whilst these both smelt great when I opened the packaging, mo matter how much I used, I struggled to smell anything in the bath. If you are looking for a bath with health benefits and pretty petals (if you take a few out of the teabag) then this would be perfect but not so good if you want a nice aromatic bath. When I want an extra indulgent bath, I have been using other products and sprinkling these on top as decoration and an added extra. I really enjoyed using these products despite the faint fragrance as they are full of natural and whole skin-loving ingredients. No additives or perfumes in sight. So not only do you get to enjoy an indulgent, luxurious bath, you can bathe knowing that it is doing your body some good. 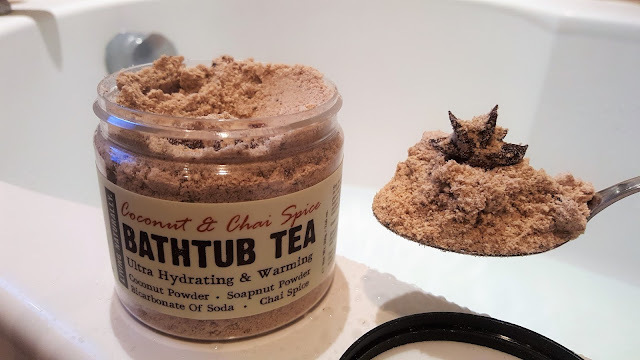 I did expect the chai powder to simply solved like the powders in a mug of my usual, but there was a LOT of coconut that just floated on the surface. This would have been ok except that desiccated coconut likes to stick itself to your skin and hair. I personally like to have a bath, get out and dry off but found I had to have a shower afterwards. I have found the ideal solution if you are like me and prefer stronger scents... Less water! A lot less. These bathtub teas are perfect foot spa teas instead. 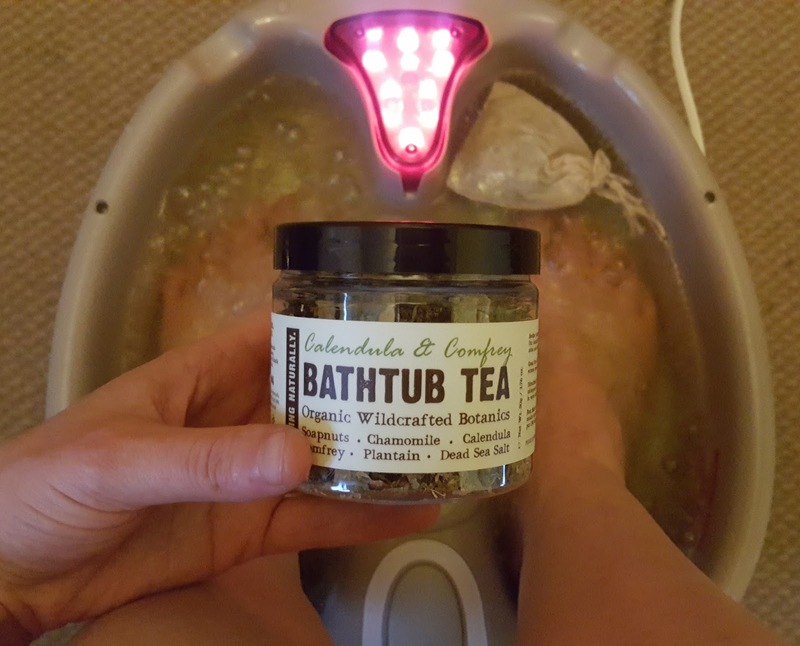 After a hard day I love soaking my feet and these products mke the experience even more pleasurable. Plus the natural properties of the ingredients are going to do wonders for your skin! As for the coconut issue with the chai tea, all I do now is spoon the powder into the reusable teabag and there we have it, no more messy coconut bits everywhere. Have you tried any of these products? If you could bathe in your favourite drink, what would it be? *PR supplied products, all writing and opinions my own. These sound amazing! I don't have a bath in my current flat, but I'm bookmarking this so I can buy them when I do have a bath! Oh stock up now as the chai one is sadly being discontinued. wow! Never heard of this but i def want to try it!! I know right?! Tea + bath = Can it get any better? I think not. Especially if you love tea like me. Just don't drink the water haha. These actually contain mineral salts so you'll get the best of all worlds. 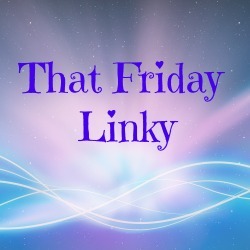 These products sound absolutely lovely - will definitely go and check them out... I love a hot bath to unwind at the weekend. Why is the chai being discontinued!? That's an amazing scent choice! Perfect for a lovely footsoak then as I do love a nice scent. Thank you, I never knew this existed!